Sherlock Holmes: The Case Of The Silver Earring. Games online. 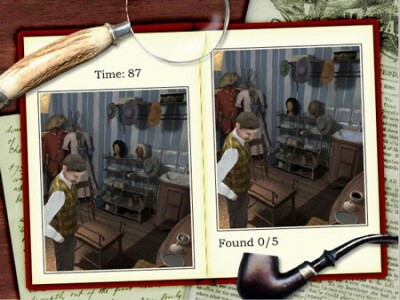 Help Sherlock Holmes solve the case of the Silver Earring by investigating the crime scenes and finding clues. In every scene there is a picture before and after the crime. Find the 5 differences by clicking on the “after” picture. You have 90 seconds and you loose 5 seconds for every wrong click.